On this date in 1284, the deposed Mongol ruler Tekuder was put to death. The Mongols had conquered half the world on the back of steppe horses and religious toleration. Mongols variously adopted Nestorian Christianity, Buddhism, and Islam, as well as tribal shamanism; it even sponsored debates among the rival confessions. What counted in the end for the men who commanded its armies was wins and losses. Our man Tekuder was the son of Hulagu Khan, a grandson of Genghis Khan who exemplified pluralistic competence. The son of a Christian but an eventual convert to Buddhism, Hulagu Khan’s signal achievement in the religious arena was done by his sword-arm: he defeated and destroyed the Abbasid Caliphate. In time, three of the four large khanates comprising the Mongol ascendancy would declare themselves for Islam … but in the 13th century the doctrine most likely to get you in trouble was simply to be too doctrinaire. 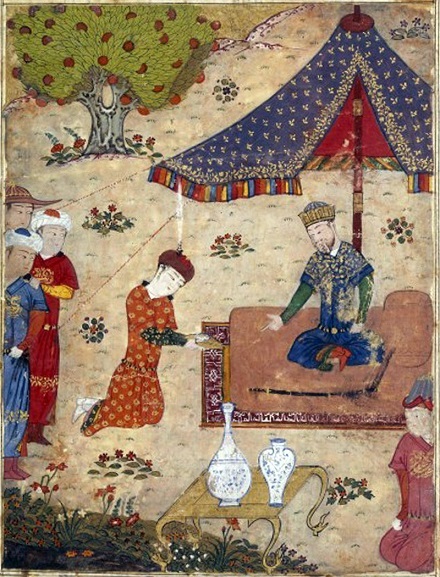 Hulagu’s son and heir Tekuder, though once baptized into his parents’ Christian faith, turned to Mohammed’s faith with a convert’s zeal and demanded the compliance of his military brass. He declared the Ilkhanate of Persia and Mesopotamia a Muslim sultanate, and tilted Mongol diplomacy away from the Franks and towards Mamluk Egypt. This split Tekuder’s coalition between Muslims on one side, and Christians and Buddhists on the other, and “the whole of the old Mongol party of malcontents, Buddhists and Nestorians alike, rallied to”* Tekuder’s own nephew Arghun. ** One may infer from this entry which man prevailed. Arghun enjoyed a successful seven-year reign with an incidental appearance in the Marco Polo saga: Arghun appealed to his great-uncle Kublai Khan to send him a wife, and Marco Polo was a part of the party that escorted that woman to Persia in 1291-1293. Marco Polo would proceed back home to Venice after this voyage, laden with Spice Road riches after a quarter-century’s absence. Arghun Khan of Persia, Kublai’s great-nephew, had in 1286 lost his favourite wife the Khatun Bulughan; and, mourning her sorely, took steps to fulfil her dying injunction that her place should be filled only by a lady of her own kin, the Mongol Tribe of Bayaut. Ambassadors were despatched to the Court of Kaan-baligh to seek such a bride. The message was courteously received, and the choice fell on the lady Kokachin, a maiden of 17, “moult bele dame et avenant.” The overland road from Peking to Tabriz was not only of portentous length for such a tender charge, but was imperiled by war, so the envoys desired to return by sea. Tartars in general were strangers to all navigation; and the envoys, much taken with the Venetians, and eager to profit by their experience, especially as Marco had just then returned from his Indian mission, begged the Kaan as a favour to send the three Firinghis in their company. He consented with reluctance, but, having done so, fitted the party out nobly for the voyage, charging the Polos with friendly messages for the potentates of Europe, including the King of England. They appear to have sailed from the port of Zayton (as the Westerns called T’swan-chau or Chin-cheu in Fo-kien) in the beginning of 1292. It was an ill-starred voyage, involving long detentions on the coast of Sumatra, and in the South of India, to which, however, we are indebted for some of the best chapters in the book; and two years or upwards passed before they arrived at their destination in Persia. The three hardy Venetians survived all perils, and so did the lady, who had come to look on them with filial regard; but two of the three envoys, and a vast proportion of the suite, had perished by the way. Arghun Khan too had been dead even before they quitted China; his brother Kaikhatu reigned in his stead; and his son Ghazan succeeded to the lady’s hand. We are told by one who knew both the princes well that Arghun was one of the handsomest men of his time, whilst Ghazan was, among all his host, one of the most insignificant in appearance. But in other respects the lady’s change was for the better. Ghazan had some of the highest qualities of a soldier, a legislator and a king, adorned by many and varied accomplishments; though his reign was too short for the full development of his fame. * Quote from The Empire of the Steppes: A History of Central Asia. ** We have met Arghun Khan in passing in these pages, as the executioner of Georgian prince Demetre II, the Self-Sacrificer. Seven hundred fifty-one years ago today, that last redoubt of that single Muslim community was extinguished when the last Abbasid caliph was put to death by the Mongols. Retrospection, of course, aids us in appreciating the “sunset” — certainly it did not occur to Musta’sim that the ascension in Egypt of Shajar al-Durr in 1250 that marks the dawn of Mamluk rule was the seed of a successor order. On the contrary, he sent this Islamic queen a contemptuous offer to provide a man for Egypt, since it could find none to seat on its throne. He would have done better to man up against the Mongols, who had not failed to notice that Baghdad lacked the muscle to protect its accumulated wealth. Genghis Khan‘s grandson Hulagu Khan (or Hulegu, or Hülegü) reduced Baghdad in a matter of days and plundered the city. ** Al-Musta’sim having combined an impolitic bluster towards the advancing horde with an utter failure to ready the city’s defenses, Hulagu Khan was most unimpressed with his prisoner. On February 20th, in a village near to Baghdad, Al-Musta’sim was executed. Contemporary chroniclers are silent as to the method; Marco Polo reported that he had been immured with his treasures in an opulent tower to starve to death. It is more generally supposed that Al-Musta’sim was rolled in a carpet and trampled to death — the Mongols’ own method for putting princes to death without shedding royal blood. However effected, the caliph’s demise ended the classical period of Islam. And yet, as Gustave Edmund von Grunebaum observes in his book on the period, that ending was itself a beginning for the flowering of high Islamic civilization that the days of the caliphate had prepared. What terminates in 1258 is the major chain of political legitimacy to which reality had failed to conform for rather more than four centuries when the extent of the Muslim empire had ceased to be coterminous with the rule of Islam and the unity of tradition had become no more than a postulate. None the less, the fall of Baghdad did more than bring home the precariousness of all human structures, even those erected on the true faith and devised to safeguard it. It demonstrated that the ‘Abode of Islam’ had become saturated with Islam, that the community no longer required a caliphate to give it a political and religious centre of gravity, that the vitality of Islam as an interpretation of man and the world, a way of life, and a style of thinking and feeling was now independent of any institutional support. … the very irreparability of the calamity made the faithful realize that the abiding of their world, its beliefs and manifestations, had outgrown any particular political form and had indeed become too wide to be contained in history. In this realization the epigones undoubtedly rejoined the innermost intent of ancestors and founder. * Later historian Ibn Tabataba, cited in The Middle East Remembered. ** Christians were spared the rapine, as Khan had a Coptic wife.